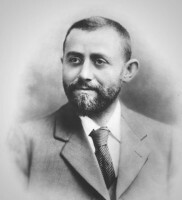 Marks & Spencer started life more than 130 years ago when the Jewish immigrant Michael Marks came to the north of England from his hometown of Slonim, Belarus. He arrived with little money and spoke poor English. 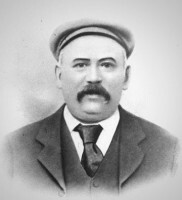 Beginning as a pedlar, he soon owned a market stall in Kirkgate Market in Leeds. He classified everything by price, but quickly stopped selling more expensive items when the penny section thrived. Michael decided to look for a partner to help manage his growing business. He initially approached Isaac Dewhirst, who had loaned money towards his original start up costs. Isaac declined but recommended Tom Spencer – his senior cashier. Tom agreed, and on 28 September 1894 Marks & Spencer was born. Tom Spencer invested £300 and brought considerable skills in administration and accounts, which complemented Michael Marks’ flair for merchandise, selling and dealing with people extremely well. Marks & Spencer called their new stores “Penny Bazaars”, keeping the penny price slogan and adding the words “Admission Free”. This was a successful marketing ploy, encouraging customers to browse without any obligation to buy. Whilst this is the norm now, it was unheard of then. 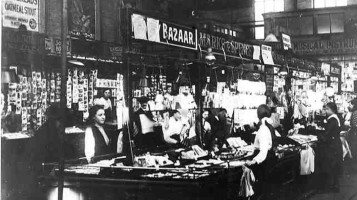 By 1900 Marks & Spencer had expanded to include 36 Penny Bazaar outlets, including 12 high street stores with the rest being market stalls. This yo-yo was donated by Joy Everett. It belonged to her mother, Alice. It was bought from the Lincoln Penny Bazaar in the 1890s by Alice’s parents. You can see original Penny Bazaar goods on display at the M&S Company Archive. This story shows from humble begings and knowing your market.The skys the limit in what you can achieve. As a student I find it Fascinating. In 1926 when we were little girls we remember going to the penny bazaar and loved seeing all the cheap goods and being able to look but not buy. Wish we could go back to these days but the experience has never changed. was Elsie Marion Marks born 1896 related to Michael Marks. She was my grandmother, and Mum always said he was related. Could you please confirm when was the M and S store was opened in Cardiff and where it was located. Thanks. My parents bought a bone China tea set from the penny bazaar in 1930 it was an engagement present to each other. It is beautiful, too precious to use. Sadly my mum was in her hundredth year died just after xmas so it is now safely stored in my glass cabinet. Hi Ellen, the plates were produced to celebrate our centenary in 1984. We have a few in the collection and are always glad to hear that there are more being used elsewhere. Thank you for your comment. Hi Denise, that is lovely to hear. The tea set is clearly very precious, and hopefully it will spark happy memories for you and your family. This is such a good store and the history. Our family are/were the Barker family, who I believe have now bought into the family firm. They worked for J.P. Parker in Croydon and of the Flower Fairies and various cousins re: Barkers of Kensington and Barkers shoes who were married to the Luce family in London. (French).